Beast Wars in 2-D? Yep. At least in Japan. For the past decade, Transformers fans have had only one choice when it came to watching their old friends Optimus and Megatron duking it out: Beast Wars (or Beast Machines as it was later called). The computer rendered show has been a moderate success over the years, but for some reason, kids weren’t drawn to the CGI characters as much as we were to the cell painted characters of yore. Well, while you’ll probably never see them on American TV, there exists another version of Transformers: Beast Wars, done in the same cell animated style as the original series. 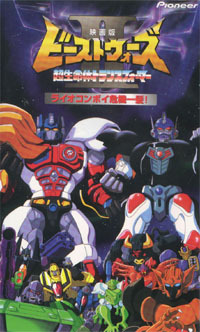 The series had three parts, Beast Wars, Beast Wars II, and Beast Wars NEO. Finding any of these episodes may prove difficult and very expensive, so before you decide to spend your savings on these unseen episodes, let me explain what you’ll be getting. Several episodes of Beast Wars II were edited into a special movie edition, so I figured that that was the best introduction to the series. In this extended episode, Lion Jr. and his Cybertron friends (autobots are called Cybertrons in this version) investigate a mysterious spaceship that crashed on the planet Gaia. Inside they find a mysterious relic, but before they can find out what it does, the evil Destrons attack (that’s what the Japanese call Decepticons). Lion Jr. manages to retrieve the relic, but in the battle, one of his companions is nearly killed. Back at the Cybertron base, Lion Jr. gets a lecture about responsibility from Cybertron leader Lion Convoy (the very cool looking lion version of Optimus Prime). As always happens when the young hero is chewed out by the older master, Lion Jr. runs away and is tempted by the bad guys, who win him over by telling him that rules aren’t fair and it wasn’t his fault. I don’t understand Japanese, but I could tell exactly what was being said, I’ve heard it so many times before. Lion Jr. gives the relic to Galvatron (Megatron), who uses it to open a portal through time and space, through which he brings Majinzarak (Demon God Zarak), a huge, three-tailed behemoth who can transform into an aircraft carrier (An aircraft carrier that drives over land and is controlled by a sailing ship’s wheel?). The Cybertrons try their best to stop the new threat, but all seems lost… until legendary Cybertron leader Convoy appears (Optimus Primal, ape version, to all you Beast Wars fans). Story wise, this is an incredibly generic Transformers story. It follows so many action cartoon clichés that no Japanese is needed to tell exactly what’s going on. If this was the series best story arch (it’s at least the highest stakes battle), then we’re not missing much by being denied these episodes. It’s not bad; it’s just that we’ve all seen this a hundred times before. How does it compare visually to the CGI version? This version if very inconsistent in visuals, at times featuring some wonderful transformation sequences, but the battle scenes are quite sloppily done. Color selection throughout is rather sickening, with far too many neon colors. Backgrounds, in the Transformers tradition (not counting movie) are uniformly dull, lifeless rocks. Character designs in robot mode are excellent, with Lion Convoy especially being as good as any old school Transformers characters. In animal mode, the characters seem VERY out of place. They don’t turn into robot animals, but cute furry animals with big watery eyes. Lion Jr. looks more like a breakfast cereal mascot than heir to the Autobot Empire. Perhaps the most disorienting thing about watching this version, after having grown up on American Transformers, is the voice acting. I’m so used to hearing the slightly digitized voices on so many characters, or at least having voice actors who sound like robots. Here, the seiyuu sound like generic action voices. Only a couple of supporting characters sound the least bit “robotic.” I don’t know if these are the same voice actors as the original series, but if they are, I think Americans were very fortunate to have our wonderful American dub. The American voice of Optimus Prime is quite possibly the best cartoon voice ever. No voice on the Japanese version reaches that level of coolness. So should American Transformers fans seek out these import tapes? At $30-$50 per tape, I’d say no. This is action anime at its most mediocre. However, if you can find a copy of a video floating around at a convention, it’s worth watching just to see how the look of Transformers has changed. It’s a notch above the CGI version in quality of action and character design, but that’s not saying much.